What color are the Paris Taxi vans ? Our vans are dark green or blue. Have a look of our vans on the picture. Taxi service is operated from or to Roissy Charles de Gaulle (CDG), Orly (ORY) and Beauvais (BVA) airports, as well as all the parisian train stations and the TGV train station at Roissy Charles de Gaulle. The driver will drop you off at the terminal from which your flight leaves, please give him this information when you are in the car. Please note that you must confirm your departure at least 24 hours in advance to make sure that all the information concerning flight times, airport and pick-up address are correct. Is the Taxi service operated in air conditioned vans ? All of the vans are non smoking and air conditioned. Also, they meet all the safety requirements of the French Ministry of Transportation. The service is operated by Airport Connection : Transportation Licence number is 2001110007028. What is the Taxi service toll free number ? Our toll-free number is 0800 CDG ORY (0800 234 679). 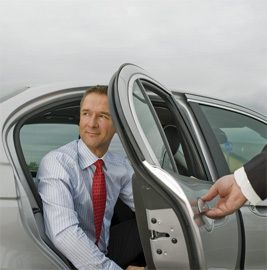 Clients having booked a shared minivan service must call when they arrive so that we can send the first driver available. Clients having booked a private minivan service, a 15 passenger minibus or a 49 passenger coach will be met at customs exit. For all services, the number is useful especially if you are held up with luggage problems. You can call from any public phone at the airport, no cards or coins are required, just pick up the receiver and dial 0800 CDG ORY (0800 234 679). If you want to call us from your mobile the toll free number is not available, and you must call +33 (0)1 43 65 55 55. Though other Paris De Gaulle airport shuttle service - such as those of Air France bus and Roissybus - can also take you to the city, they will drop you off at the Arc de Triomphe or the Paris Opera. From there, you will still need to take a taxi, bus or subway to reach your destination. Licensed by the French Ministry of Transportation, Airport Connection's fleet of air-conditioned, non-smoking vehicles operates out of Charles de Gaulle, Orly and Beauvais airports — 7 days a week, 365 days a year. Ideally suited for the individual traveler, family, or large group, we offer you the choice of a shared or private 8-seater minivan, as well as our private 15-person minibus or 49-person coach. 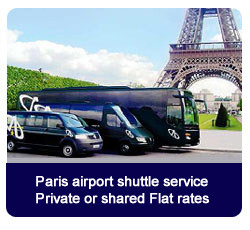 Book your De Gaulle airport taxi at flat rates.